Over/Under: Over 167.0 at 1.90 Bet Now! The first game of the season for these two sides in Group B in the Eurocup was also the first time the two sides have clashed. It ended in an 88-81 win for the Berlin side with Elmedin Kikanovic offering up a stunning 25 points and 6 rebounds. The hosts won their next two games after that loss but suffered defeat in their most recent game, leaving them with a 2-2 record. With the Germans holding a 3-2 record, a home win in this game will draw the teams level of records and could give the hosts the chance to sneak ahead of their opponents. There is a need to play with desire but also with brains, and this is where the experience of veteran player Marko Popovic may make a massive difference. He has delivered an average of 17.3 points per game this season, and if he can continue this run of form in this game, Montakit will be feeling a lot better about life. Ivan Paunic has also been a big player this season, averaging 11.3 points per game and Moussa Diagne has provided an average of 10 points per game. One thing to look out for from the German side is their scoring prowess. The team is currently second with respect to best offence in the tournament with an average of 92.2 points per game. This backs up their 3-1 record and in Kikanovic, they have one of the most influential players in the tournament. He has delivered an average of 23 points per game this season, which is the second best in the tournament so far, and if he delivers, this could be a strong night for the away side. They have also been boosted by strong performances from Dominique Johnson, with an average of 14.8 points per game and Dragan Milosavlevic, with an average of 12.5 points per performance. 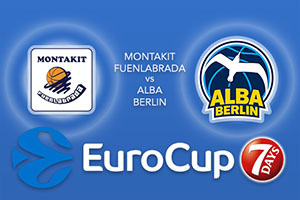 You can take ALBA Berlin at +6.5 which is provided at odds of 1.90 for the Wednesday night clash. For the Over/Under market, look to go OVER 167.0 which is provided at odds of 1.90. Bet Now!